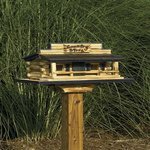 Bring all of the pioneer charm of the Amish countryside to your garden with this solid wood bird feeder styled after a rustic country store! With log-style walls, open windows and door, a store front sign and even some imitation greenery, this bird feeder promises years and years of smiles and happy birds. Simply lift the rear portion of the roof to fill the hopper with your favorite bird feed. If you have any questions at all about this bird feeder, please don't hesitate to get in touch with us by phone or email.